In 1963, the flight from Jamaica to Toronto was 8 hours. Today it’s 3 1/2. Countless people have made the dwindling journey over the years, but in the sixties and seventies there was a new breed of traveler: the finest ska, rocksteady, and reggae recording artists the West Indies have ever produced. We’re talking Studio One, Treasure Isle, Trojan, and WIRL veterans Jackie Mittoo, Johnnie Osbourne, Wayne McGhie, Lloyd Delpratt, The Mighty Pope, Noel Ellis, Jo-Jo Bennett, and many more. Arriving in their new Canadian home, these talented singers, songwriters, musicians, and performers simply did what came naturally to them. One by one, they hit the studio and captured some of the hardest tunes this side of Kingston. 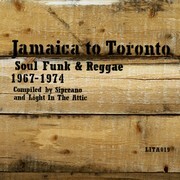 Jamaica to Toronto: Soul Funk and Reggae 1967-1974, details this crucial sonic migration and stands tall as the second helping of Light In The Attic’s new Jamaica to Toronto series, compiled by DJ/Canadian music historian Sipreano, along with Light In The Attic. 01. Jo Jo & The Fugitives - "Fugitive Song"
02. Eddie Spencer - "If This Is Love (I'd Rather Be Lonely)"
03. Jo Jo & The Fugitives - "Chips Chicken Banana Split"
04. Jackie Mittoo - "Grand Funk"
05. Lloyd Delpratt - "Together"
06. Cougars - "I Wish It Would Rain"
07. Jonnie Osbourne - "African Wake"
08. Ram - "Love Is The Answer"
09. Bob & Wisdon - "I Believe In Music"
10. The Sheiks - "Eternal Love"
11. Wayne McGnie & The Sounds Of Joy - "Fire (She Need Water)"
12. Cougars - "Right On"
13. Eddie Spencer - "You're So Good To Me Baby"
14. The Hitch-Hikers feat The Mighty Pope - "Mr Fortune"
15. Noel Ellis - "Membories"
16. Wayne McGhie - "Here We Go Again"